On the basis of colloidal silicon dioxide there are no analogues. Other enterosorbents may be suitable as an analogue; consultation with a doctor is necessary. “Polysorb” rightly refers to a new generation of enterosorbents, as it is able to bind and remove from the body not only toxic compounds, but also heavy metals in the form of salts, as well as toxic and carcinogenic substances. The drug effectively copes with severe intoxication and prevents the development of complications. Note! The tool can be used for prophylaxis in people whose professional activity is associated with working in adverse conditions (with a high level of water and soil pollution) or in direct contact with hazardous substances (in the chemical industry). 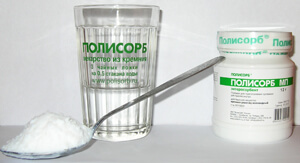 To prepare the oral suspension, it is necessary to mix the recommended amount of the drug with water (100 ml). The resulting composition is consumed orally before meals (at least 1 hour). It is also worth maintaining an interval of 60 minutes between taking Polisorb and other medications. The dosage regimen in adults does not require individual correction and is 0.1-0.2 g per kilogram of weight. The specified amount should be taken 3-4 times a day. Important! It is not allowed to exceed the maximum daily dosage, which is 20 g.
The regimen in children is similar to adult patients, and the dosage is adjusted individually, based on the child's body weight. 3 g of the drug = 1 tablespoon with a slide. The duration of application depends on personal factors, the effectiveness of therapy and the severity of the clinical result, and ranges from 3 to 14 days. 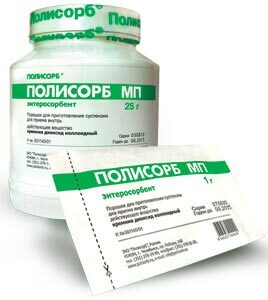 "Polysorb" can not be taken in duodenal ulcer and stomach, especially in the acute stage. It is also prohibited therapy with the use of this medication for internal bleeding of the gastrointestinal tract and intestinal atony. In case of hypersensitivity to silicon dioxide, an allergic reaction may occur, therefore, such patients are not recommended for treatment with Polysorb. In the manufacturer's instructions, pregnancy and breastfeeding are not indicated as a contraindication for the use of the drug. However, there is no data confirming the safety of the use of Polisorb during these periods. For this reason, the appointment of the drug should be carried out strictly according to the indications and after consultation with the gynecologist (obstetrician) or pediatrician. Cases of overdose have not yet been recorded. 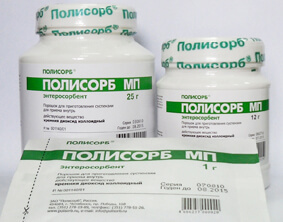 In exceptional cases, while taking Polysorb, constipation and other disorders in the digestive system can occur. In some patients, drug treatment was accompanied by minor bouts of nausea and allergic manifestations. Side effects of Polysorb therapy can also include impaired absorption and absorption of certain vitamins and macronutrients, especially calcium. Therefore, all patients are recommended to take vitamin preparations of the combined action, as well as supplements containing calcium. Polysorb is a monocomponent preparation and consists of a non-selective colloidal type of silicon dioxide. The tool is available in the form of a powder for the preparation of suspensions (the composition is odorless, painted white, a bluish tint is allowed). When diluted with water, a characteristic precipitate is formed. Silicon dioxide is not metabolized and not absorbed by the digestive tract. Excreted from the body naturally with feces in unchanged form. The drug can be stored for 5 years (within the expiration date) in a tightly closed container, precluding the penetration of dust particles and sunlight. The finished composition (suspension) can be stored for two days at a temperature of from 14 to 25 degrees. 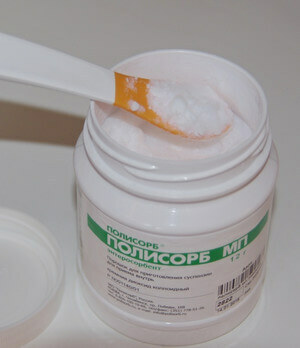 Polysorb MP is an effective and safe remedy for a hangover. This sorbent treats the very cause of the hangover syndrome - alcohol intoxication. For a year now I've been using Polysorb to fight hangovers and alcohol. I always use it in such a case. Having experienced the effect of Polysorb, I was pleasantly surprised how quickly and efficiently it copes with pimples. I made masks from Polysorb once a week for 15 minutes and somewhere after two months I noticed that 60% of my acne had gone off my face. cleaner and fresher. Now Polysorb is always present in my makeup bag !! loose stools what to do? Can I polysorb cure? If it is poisoning, it can help. But if it lasts more than a day, or if you feel other symptoms, consult a doctor.